Black holes are the most extreme objects in the universe, and yet they are ubiquitous. Every massive star leaves behind a black hole when it dies, and every galaxy harbors a supermassive black hole at its center. Frighteningly enigmatic, these dark giants continue to astound even the scientists who spend their careers studying them. Which came first, the galaxy or its central black hole? What happens if you travel into one - instant death or something weirder? And, perhaps most important, how can we ever know anything for sure about black holes when they destroy information by their very nature? 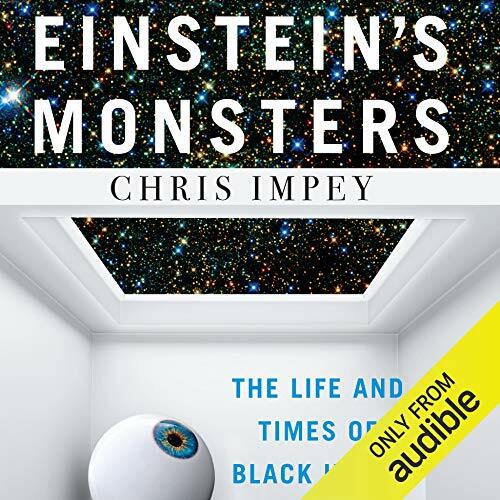 In Einstein’s Monsters, distinguished astronomer Chris Impey takes listeners on an exploration of these and other questions at the cutting edge of astrophysics, as well as the history of black holes’ role in theoretical physics - from confirming Einstein’s equations for general relativity to testing string theory. He blends this history with a poignant account of the phenomena scientists have witnessed while observing black holes: stars swarming like bees around the center of our galaxy; black holes performing gravitational waltzes with visible stars; the cymbal clash of two black holes colliding, releasing ripples in space-time. Clear, compelling, and profound, Einstein’s Monsters reveals how our comprehension of black holes is intrinsically linked to how we make sense of the universe and our place within it. From the small questions to the big ones - from the tiniest particles to the nature of space-time itself - black holes might be the key to a deeper understanding of the cosmos. ©2019 Chris Impey (P)2019 Audible, Inc.